Now that the hint of spring is in the air, now that the birds are singing longer and louder, the sun is taking its time to set, and the leaves are starting to look green again, perhaps it is time to get out in your garden and make it match the season. Banish the mud and muck and present something with more colour, more interest, and more personality. 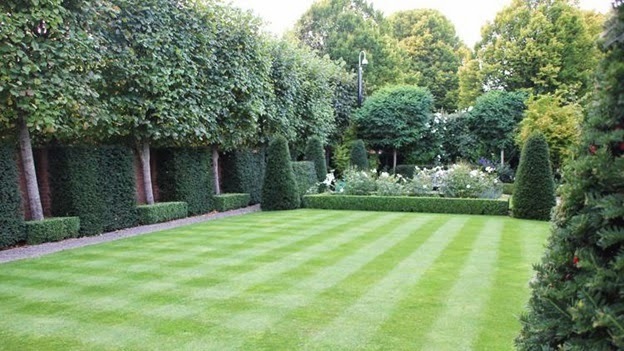 If you have been enjoying the early spring weather, but your garden is still looking as though it is in the grip of a harsh winter with piles of mulchy leaves and dead, brown grass lying in the way of what it could be, then why not do something about it? It can take as little as 48 hours to renovate your garden and to change it from something dull and dismal into something bright and bursting with the promise of the summer to come. If you’re not sure where to get started, these five handy tips for reinvigorating your tired winter garden into a vibrant summer one will point you in the right direction. So get your boots on, take a deep breath of that springtime air, and go for it – you’ll be amazed at the striking results, all of which can be achieved over a single weekend. Tidying up the garden might not seem like it will do much, but it will actually make a huge difference. When you start looking, it is likely you will find a good black bagful of rubbish that has been blown into the garden over the winter. It may not all be yours, but you can’t leave it there – make sure you wear gloves, and if bending down or reaching is difficult for you, it might be worth investing in a litter picker, which will also come in handy throughout the year to keep your garden looking at its best. Tidying isn’t just about clearing up the rubbish though. It’s time to put away all those old bits and pieces – tools, toys, furniture and so on – so that you can get to every inch of the garden. Give yourself room to move. Once you have the garden as clear of rubbish and empty of accessories as possible, it’s time to start weeding. Not much grows over the winter, it’s true, but weeds don’t seem to have got this message, so there will always be nuisance plants to get out of the flower beds. Not only that, but those lovely seeds and plants you put in the earth this time last year will need to be removed if they have died, and thinned out if they have survived. Once the old stuff has been removed, it’s time to bring in the new. Spring flowers that add colour and charm to the garden are ideal – try pansies, yellow trillium, redbud, lilac, hyacinth or crocus to name just a few. As long as they are colourful and beautiful, they will look wonderful in your refreshed garden. Over the years, your garden fences suffer much abuse at the hands of the weather and the seasons. Although you might like the idea of replacing the whole thing, this is an expensive and time consuming job. So if you can’t replace your fence, why not renew it? By painting your fences and gates you will immediately bring new life into the entire area, especially if you use an unusual colour that complements the plants and shrubs you are growing. Painting can take time, though, what with the number of coats required and the need to get it just right. In order to get the paint coating your fences quickly and evenly, it is well worth investing in an air compressor (here is a pretty good selection). Using a machine like this to spray paint your boundaries will cut the time it would otherwise take dramatically, meaning you can give your garden a brand new look in record time. There is nothing like sitting in your garden, relaxing with a cold drink, listening to the peaceful sound of trickling water. By adding a water feature – whether a traditional waterfall over stones, a fountain, or even a fish pond – you are adding a sense of enchantment and serenity to your garden which will keep you happy for many years to come. It’s good for the wildlife too, and they are easy to install and relatively inexpensive for a small model. If you have a patio or decking area, this will have become grubby and discoloured over the winter. It’s just one of those things, and no matter what you do, it cannot be prevented. But it can be solved easily, especially if you have purchased an air compressor as mentioned above. With this tool you simply need to add a spray attachment and use the powerful motor to blast water onto the flooring, washing away the muck and dirt that has accumulated. Once the patio or decking area is clean, you might just be surprised at seeing the colour it is supposed to be! These five tips will reinvigorate your garden and bring it back to life and with a bit of hard work over a weekend, you’ll be ready to welcome spring with open arms.